Ewer; jasper; gold mounts, enamelled and jewelled; shoulder with band of shallow fluting; flat mount to lip, engraved with flowers enamelled ruby and green; overarching scroll handle, enamelled lavender, outside set with rubies and terminating in lion mask; inner whirl of handle is double, enamelled black on underside; foot mounted in similar style, set with rubies. Origin: Uncertain; previously described as 'French, 16th century', but more probably substantially altered in second half of 19th century, perhaps in Germany. Commentary: The quality of the enamelled gold mounts is exceptionally poor in both design and execution. They are so inferior that the former attribution (in Read 1902 and Dalton 1927) to a French workshop in the sixteenth century has to be questioned and critically analysed. There is also a very striking difference between the quality of the jasper oviform body and that of the neck section above the fluting. The body is a beautifully proportioned polished hardstone of attractive colouring and interesting veining, with a subtly worked band of restrained classical ornament on the shoulder. The body has all the characteristics of a fine product from one of the sixteenth-century Court workshops, perhaps in Northern Italy (Milan? ), as early as the middle of the century. 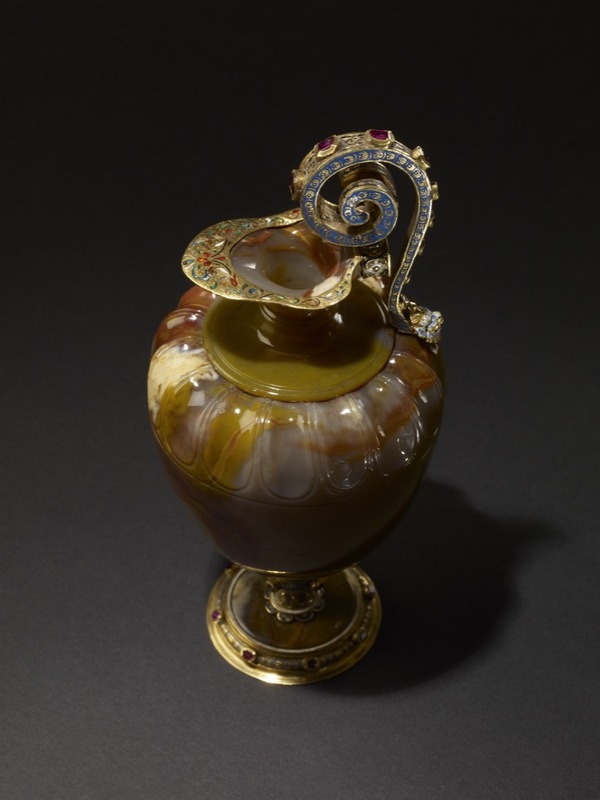 It compares with the miniature cups and cover (H. 16 cm), made of jasper and carved with similar concave fluted ornament, preserved among the Medici collections in the Museo degli Argenti, Florence (Kirsten Aschengreen Piacenti, ‘Il Museo degli Argenti’, Milan, 1967, p. 141, no. 244; Kirsten Aschengreen Piacenti, ‘Capolavori del Museo degli Argenti’, Florence, 1969, p. 68, col. pl. ), or, indeed, the rock-crystal ewer in the Prado Museum (D. A. Iñiguez, ‘Catálogo de las Alhajas de Delfín’, Museo del Prado, Madrid, 1989, p. 120, no. 74). In contrast, the neck section is a feebly formed, dull piece of hardstone that is abruptly joined on to the fluting of the body in a most insensitive and wholly improbable manner. Neither the neck itself nor the oval lip has any Renaissance or Mannerist character, and this weakness is repeated around the lip, where the gold rim-mount is both flat and thin with neither a sense of three-dimensional form nor even a strong outline. When the hardstone stem was broken, the foot was drilled (through the stub of the stem) and a modern threaded rod and nut were used to repair the damage; but it is clear that the rest of the enamelled gold stem was also made at the same time. It is carefully designed to hide the broken stem, and the lower lobed edge is calculated to rest almost horizontally on the upper surface of the foot. When the enamelled decoration and goldsmiths' work of the short stem are closely examined, they are found to share many of the inferior qualities that mar the rest of the gold mounts, and therefore to indicate a common origin. The Vasters workshop in Aachen appears to have produced a high standard of enamelled decoration, although it is by no means consistent. There were probably craftsmen of different levels of skill employed by Reinhold Vasters, but as yet none has been identified. However, the clumsy mixing of blue enamel on to the white enamelled mask at the base of the handle is a particular example of incompetence that is not usually found on Vasters fakes, and may in time help to determine the location of the nineteenth-century workshop responsible for this restoration in the Renaissance style. Hugh Tait, 'Catalogue of the Waddesdon Bequest in the British Museum. III. The Curiosities', British Museum, London, 1991, no.27, figs. 263-266.